What's that burning question about Americans that keeps us awake at night? Their thoughts on nuclear war? Hacking and spying? Economic sanctions? No; none of the above. In fact, Russians wonder most about American attitudes toward shoes. We took a close look at search queries on the Russian-language internet starting with the words "Why Americans..." and discovered what aspects of the lives of people in North America are of interest to Russians. 1. Why do Americans wear outdoor shoes indoors?If you have been to Russia, you'll know that at home it's the norm to change footwear because often the pavements outside are covered with slush or snow. Furthermore, this also applies to other premises: Children change into indoor footwear at school, and adults at work. Hence, Russians are very surprised that in America people wear the same shoes at home and outside. On the Russian-language internet there are heated debates on the subject: Is it to do with cultural traditions, or the lack of cleanliness on city streets, or because houses are too cold? But it's still not clear why anyone should wear boots indoors. 2. Why do Americans always smile?They say that Russians rarely smile (and here's why). But there's the opposite stereotype about Americans - that they always smile. For Russians, smiling for no reason is very bizarre, and they feel there must be something behind it, or at least that it's not sincere. Incidentally, Americans often search on the internet for why Russians are so gloomy because for Americans a smile is just a question of being polite. 3. Why do some Americans wash clothes in launderettes and not at home?An estimated 15-20 percent of Americans are classified as poor, with many more barely able to make ends meet. 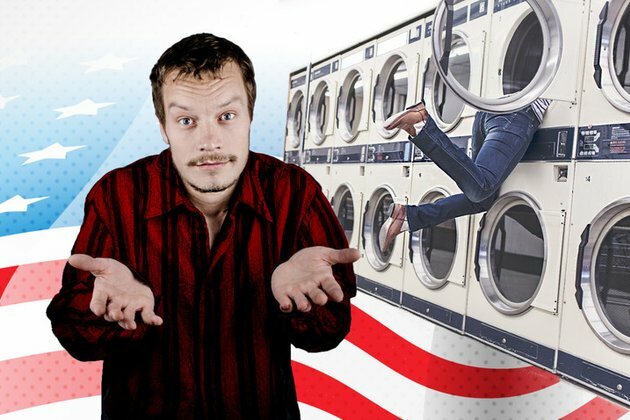 Having one's own washer and dryer at home is not a priority for many Americans. In Russia, the situation is very different. A Russian apartment might not have a cooker, but it definitely has a washing machine! And this applies not just to your own home but also to rented accommodations. You just don't wash your clothes by hand or take them to public launderettes. Still, many Russian cities have inexpensive dry cleaners and launderettes, but these are used only for bulky items such as sofa covers or expensive evening outfits. 4. Why are Americans so fat?As is well known, many Americans are overweight, and the country leads the world in obesity. While there are a fair number of fat people in Russia, their numbers are much smaller. Thus, Russians want to know why Americans are overweight: Is it a result of a love of fast food, or genetically-modified foods, or due to low physical activity? According to experts, American obesity is due to answers No. 1 and No. 3. 5. Why do Americans live on credit? Credit cards and bank loans are ubiquitous in American society. This is not the case in Russia, where few have credit cards; (but nearly everyone has a debit card). Also, unlike the U.S., having a credit history in Russia is not so important when renting an apartment or applying for a job. In Russia, it's not compulsory to have a credit history even when you apply for a mortgage. At the same time, interest rates in Russia are much higher compared with America, and many people prefer to borrow from a bank only for big purchases, such as buying property, doing home repairs, or buying a car. 6. Why are Americans afraid of clowns?In Hollywood horror films, clowns often feature as the main villains, and Russians can't understand why they scare the heck out of Americans. In Russia, neither children nor adults have such fears. Clowns are usually associated with the circus and with entertainment, rather than with cruel masked jesters. Many Soviet and Russian actors became famous thanks to their clown roles: Yury Nikulin, Oleg Popov or Slava Polunin. How could one be afraid of them? 7. Why do Americans have such white teeth?Since Americans love their smile so much, it's natural that they want pearly white teeth. In Russia teeth whitening is not regarded as a healthy procedure and few people have it done. Although it's popular among celebrities, dentists recommend leaving teeth their natural color. Furthermore, water in Russia does not contain fluoride. 8. Why do Americans wear their wedding ring on their left hand?In Russia, the wedding ring is worn on the ring finger of the right hand because it's believed that this finger is associated with the heart. Meanwhile, rings are worn on the left hand in Russia by someone who is either divorced or widowed. Incidentally, some young women wear two rings at the same time: Their engagement ring and their wedding ring. They wear their engagement ring on their right hand and wedding ring on their left, while others wear both rings on their right hand. 9. Why do Americans have two names?Unlike in America, there is no middle name in Russia. At birth a child is given only one name, but they do receive a patronymic derived from their father's name. In Orthodox Christianity there's also a tradition at baptism of giving a child an additional name, usually in honor of a saint born around the same date. It's believed that the saint will be the child's guardian angel and therefore it's not revealed to anyone except relatives. 10. Why do Americans say "OK"?The habit of saying that "everything's OK" is also very popular in Russia. But almost no one knows what it means. Well, it's time to extend both thumbs upwards, and hit the "like" button!